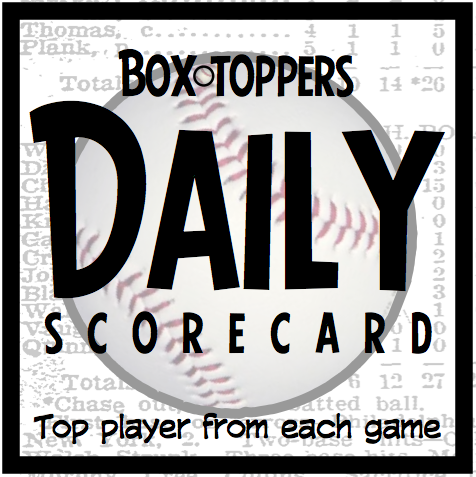 Marlins pitcher Jose Fernandez is Tuesday's Player of the Day and rises to seventh place in Box-Toppers player standings for the season. Fernandez pitched seven shutout innings in the 1-0, 10-inning win over the Royals. However, Fernandez left with the game tied 0-0 and earned no decision. Fernandez earns 2.0 Box-Toppers points for being Player of the Day, giving him 15.0 for the season, moving up to seventh place among all players. Alfonso Soriano of the Yankees is American League Player of the Day. Soriano hit two homers and drove in six runs in the 14-7 win over the Angels. Scooter Gennett of the Brewers is National League Batter of the Day. Gennett hit two homers and drove in three runs in the 5-1 win over the Rangers. This was Gennett's Box-Toppers debut, the first time he has earned Player of the Game honors. He is the 3,254th player to debut in Box-Toppers since record-keeping began in 1995.
Notable: Paul Goldschmidt of the Diamondbacks rises to 20th place in Box-Toppers player standings for the season after he earned Player of the Game honors Tuesday. Goldschmidt (2HR including walk-off, 3-5 in 4-3, 11-inning win vs. Orioles) earns 1.0 Box-Toppers point, giving him 11.7 for the season. In addition, he becomes top NL batter in Box-Toppers points, passing Carlos Gonzalez of the Rockies (11.0). Fernandez receives 2.0 Box-Toppers points for being Player of the Day. Soriano receives 1.7 for AL Player of the Day. Gennett receives 1.5 for being NL Batter of the Day.